COMMENT: A comparison of official Department of Agriculture data highlights the evolution of livestock farming in Ireland over the past decade. 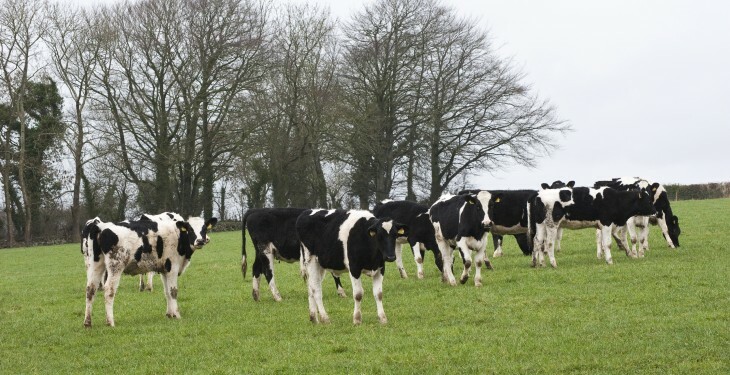 Between 2002 and 2012 the number of beef and dairy livestock herds in Ireland have declined by over four and half thousand herds to 107,308 registered herds in 2012. A deeper analysis of this data highlights some interesting trends. 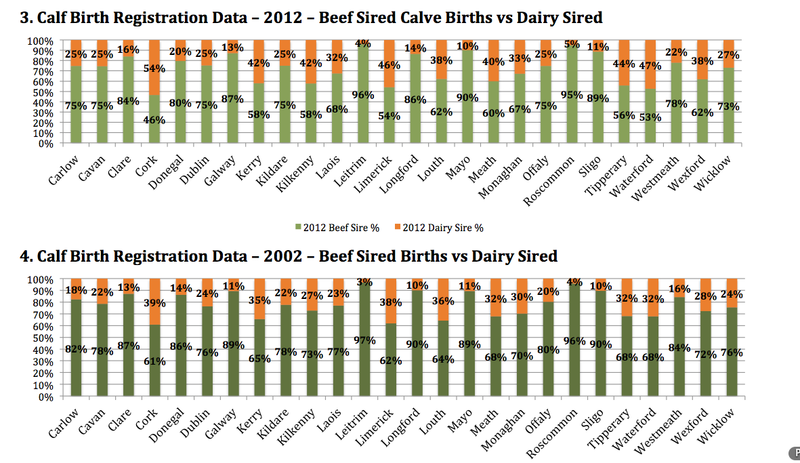 Decrease in calf births to a beef sire in every county with the exceptions of Louth and Westmeath. Increase in calf births to a dairy sire in every county with the exception of Mayo and Sligo. Calf births to beef sires are down from 1.625 million in 2002 to 1.453 million in 2012, a net decrease of just over 10 per cent or 172,000. Almost two-thirds of this decline can be attributed to just seven countries; Clare, Cork, Kerry, Limerick, Mayo, Tipperary and Waterford. Cork and Kerry accounted for the highest decline in numbers, with 57,183 or just over 33 per cent of the total decline nationally. Calf births to dairy sires are up by a third in the last 10 years from 554,300 births in 2002 to 748,630 in 2012, a net gain of 194,330 calves. 80 per cent of this gain occurred in seven counties; Cork, Kilkenny, Limerick, Meath, Tipperary, Waterford and Wexford. Cork and Tipperary alone account for almost half, with 91,000 increase in calf births to a dairy sire. Across the country total combined calf births were marginally higher in 2012 than they were in 2002, with the strongest gains seen in Leinster, an increase of six per cent and a 10 per cent decline noted in Connacht. 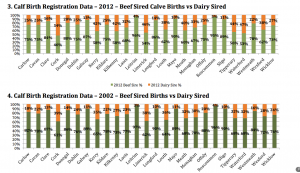 A clear winner in over the decade has been the greater number of calf births to dairy sires over those of beef. Much of this decline in calf numbers to beef sires can be explained by the movement of dairy farmers away from cross breed beef to dairy bulls. Comparing Department of Agriculture numbers for 2012 and 2007, we see an increase of over 200,000 calf births to dairy breeds within the dairy cow herd. During the same time period the number of dairy cows calving beef calves from the top five beef breeds has declined by more than 147 thousand. Munster and Leinster post strong gains here. 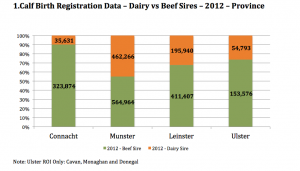 In 2002, 33 per cent of calf births in Munster were to a dairy sire. This has jumped to 45 per cent in 2012. The largest changes were seen in the counties of Cork, Tipperary and Waterford, see supporting graphs attached. In fact Cork is now the only county in the Republic of Ireland where births to a dairy bull exceed those of a beef breed. 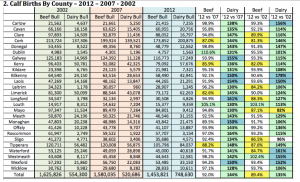 In Leinster the largest shift towards dairy sires was seen in counties Kilkenny and Wexford. 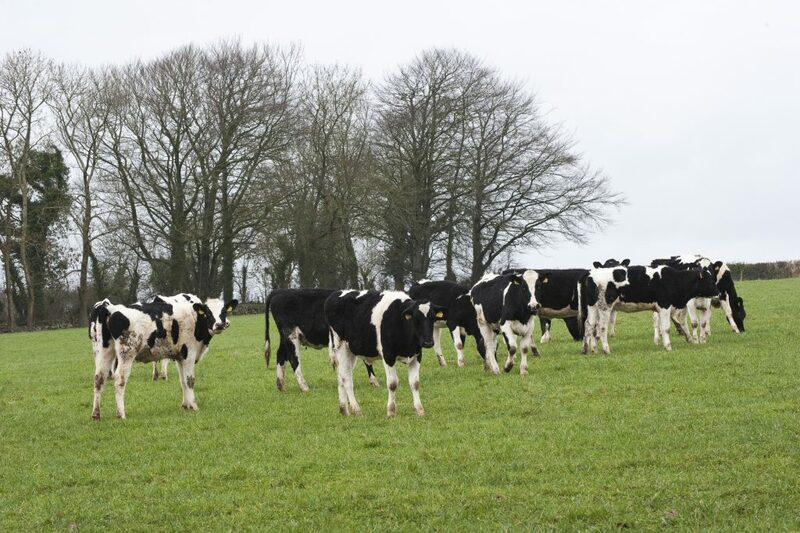 A marginal move towards using dairy breeds was seen in the Ulster counties of Cavan, Monaghan and Donegal. 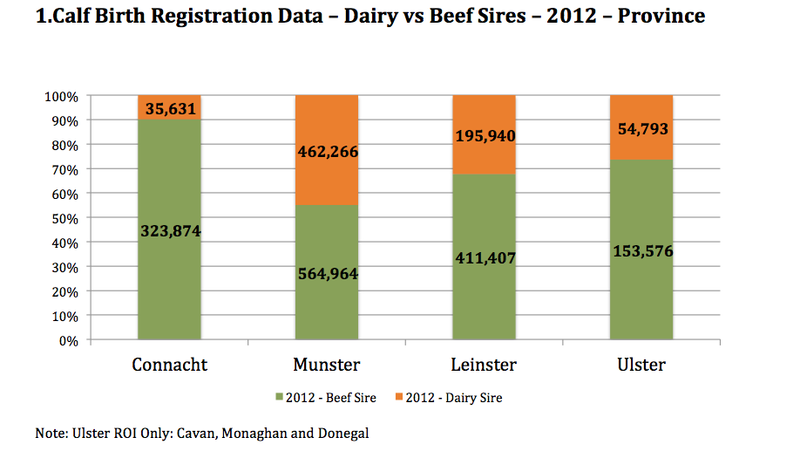 Connacht sees virtually no change over the past decade with 90 per cent of calves born continuing to be beef sired. 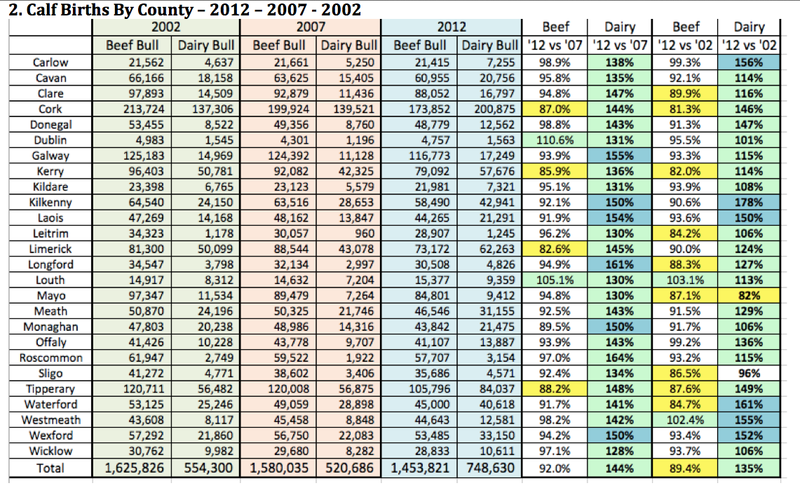 That said, Co Mayo experienced a decline of more than 2,100 dairy calves per annum in 2012 compared with 2002. This decline was off-set by a net gain of almost 2,300 dairy bred calves per annum in Co Galway.